Given that this is my first real effects film (I only had 120-odd effects shots in Leap 2) I’ve been doing a lot of studying up on effects and shooting them. When I shot Leap 2, I watched the Bourne films over and over. Now I’m watching a lot of Transformers 1,2, and 3, The Avengers, Captain America, and Resident Evil: Retribution. I’ve also been watching a bunch of independent short films that are effects heavy. Not only am I looking to learn how to shoot for CG, but also what gives these films their epic scale. Most of it comes down to composition and camera movement. We will be shooting on my T2i, and though it’s an older HDSLR, it’s still running strong. I was a bit worried about doing effects within the limited colorspace I have, but I don’t think it’ll be a problem. I’ve been shooting tests with the kids of the family I’m staying with, tests of shots I’m planing on using in the film. So far, they’re turning out just fine. In the process, I’m getting practice shooting for effects (the hardest part is visualizing the where exactly the CG is in the frame) and I’m learning more intimately After Effects and especially the rotobrush. I think the rotobrush gets a bad rap sometimes for being too sharp, but I’m learning how to tweak it and keyframe it’s feather to handle motion blur. Software-wise, I’m cutting in Premiere and dynamically linking effects shots into AE. Once in AE, I have access to it’s 3D tracker, the aforementioned rotobrush and Element 3D 1.5. On the last film, After Effects was what made the movie possible. This time it’s AE and more specifically, it’s Element plugin. To complement Element, I’m running the latest version of Blender to animate models I get from a Top Secret website (no, it’s not Turbo Squid). A bunch of the models I’m using have been pulled from videogames, so I’m significantly altering their diffuse texture in Photoshop so they won’t be recognized. Element’s biggest strength is also it’s biggest drawback: In order for E3D to be realtime, it’s rendering engine is basically the same found in video games. This can make it difficult to achieve the photo-realism that I’m going for, so I’m planing to save Element for shots with a lot of motion blur or shots that have elements in the distance. I’m currently in the middle of breaking down the script right now and for the first time on a movie, I’m scheduling a second unit. But here’s the thing, I AM THE SECOND UNIT. Let me explain. In order to keep costs down, I’ll be shooting everything with the actors at one time. Our schedule is looking to be about a month and a half. This is the first unit. Then, when I’m all done with the actors, I become the second unit director and will be shooting all the plates and elements that I’ll need for the effects. There’s a lot of establishing shots and plates that I won’t have to shoot with actors, so why schedule them then? If I know a shot will have a digital double, there’s no point in having the actor there. We’ve got too much other movie to shoot. When I wrote the script, I had planned to shoot the film in both Montana and in Spokane, WA. To cover wages, food, props and travel/lodging costs, the budget is sitting at about $18,500 (roughly) right now. A major chunk of that is bringing the actors out to Montana and putting them up for the duration of the shoot. I may be better off finding locations an hour from Spokane and then I can either cut that cost or put the money elsewhere. I haven’t decided on this on yet, still praying about it. The script is now locked! I’ve printed out draft five, and I’m calling it finished. Yes, we now have a shooting script 🙂 It’s been sent to the team and the response has been positive. I dug out my old eighths ruler that I made a few years ago and calculated the eighths the other day. Although there is software out there that’ll do it for me, I find doing it by hand helps solidify the details of the script in my mind. Wearing all the hats that I do, I have to know the script frontward and backward. Well, I gave Gorilla a try, but I wasn’t happy. It kept locking up on me so I ditched it a few weeks ago. I’ve spent since then looking for a good replacement for scheduling but nothing was turning up. I was so desperate that I even tried Celtx again, but I had to use Trelby as a middle man to get the script into Celtx and Celtx kept locking up, being extremely buggy. I somehow stumbled upon an article that mentioned Sophocles has a scheduler and even budget module. I managed to acquire the discontinued beta for Sophocles 2007. WAY back when I was in eighth grade, I actually had used Sophocles to write my first attempt at a feature script. While I don’t think I’d consider switching from Final Draft for the writing of a script, I’ve been nothing but happy with its other features. First off, when I imported the script for Leap 3, I noticed that it gave me a runtime count, in minutes, along the side of the page. That’s really cool. Leap 3, though a 97 page script, should run 93 minutes according to the count. I discovered the software has an auto-schedule feature, so next I added location details and told the software when certain actors are available. I then ran the auto-schedule and it it gave me a good start for a shooting schedule. Pretty smart AI. I also gave the budget module a once over and I think it’ll do the job nicely. It’s a shame that the company went bankrupt, but I’m glad I found the beta copy. You can be sure that I’ll hang on to it incase I ever need to re-install. In other Leap 3 news, a friend of mine, Kimberly Cruz (she played the reporter in Leap 2) has really stepped up to the plate and shown some real initiative as a producer. She has a potential source that she is approaching for funding. She is also very interested in playing the role of Kati. Welcome to the team, Kim! I used Premiere my junior and senior years, then switched to Vegas after graduating. As you know from my recent blogs, after nine years with Vegas, I’m back to Premiere, coincidentally, it’s another “6” release, CS6. Given these circumstances, I thought it’d be fun to play with the version I used in high school again, so I got online and found a “portable” version of 6.0. When it’s splash screen came up, I was whisked back to my junior year, when I’d stay after school just to get more time editing. Premiere has come a long way these past ten years, but it’s still fun to re-visit my roots. I’m tempted to do a small project on it, standard def of course (HD wasn’t around back then). I hope you enjoy the above photos, showing how far it’s come. As I have mentioned on here before, I started editing video in high school using Adobe Premiere 6.0. 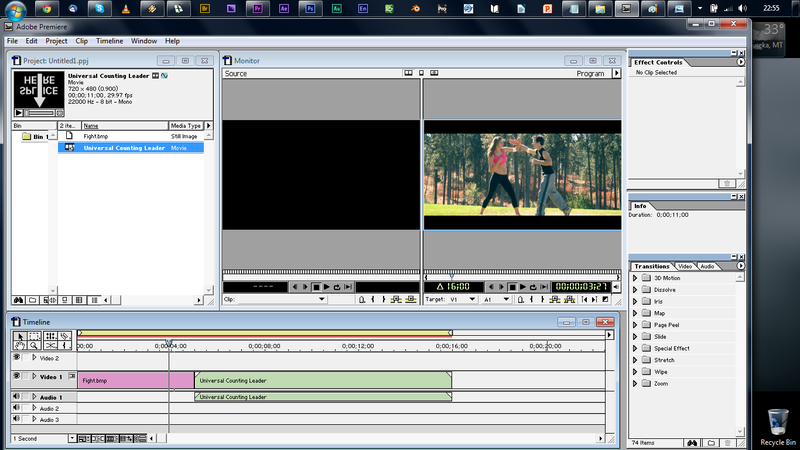 After graduating, I switched to Vegas Pro, which I have used since since version 4. 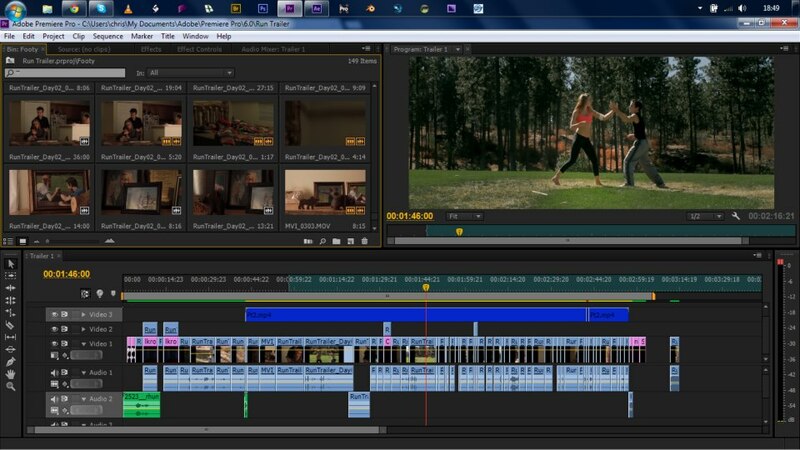 For nine years, I’ve been a Vegas cutter, but recently, with the amount of effects work my projects have been involving, it made sense to start using Premiere again for editing. The reason is that getting your cut into After Effects from Premiere is as simple as copy and paste. Also recently, I’ve taken on the producer role for Twinkle Adams’ first feature, “Run”. Since she hasn’t directed before, I went back to Spokane this last weekend to shoot a trailer for the film. Aside from giving her experience and me the fun of filming (I live for this), I thought it would also be a good opportunity to get better acquainted with Premiere CS6. The goal I have set for myself is to only use Adobe products to complete the trailer (with the exception of ADR, for which I used Vegas Pro 11). I just finished locking picture, the grade and effects. So far, the transition to CS6 has been relatively simple. Editing is editing, you just have to learn the nuances of each software. Coming from Vegas, the first thing I did was customize my workspace and shortcuts, the most important switching “CRTL K” to “S”. After nine years of S to split a clip, that’s a habit I won’t break. Another thing I tried, but probably won’t be doing again, is editing in 2.40, rather than 16:9. Shooting with Magic Lantern, I had cropmarks that showed me what my final frame would be. Unfortunately, the way Premiere works, when you stick 1920×1080 footage into a 1920×800 sequence, it wants to render it before it’ll play. So while I was able to edit in it’s final aspect ratio, the rendering wasn’t worth it. At first, the shots were playing back just fine without rendering, but once I had over 30 seconds of footage on the timeline, things got slow. On the plus side, once they were rendered, they played just fine. At the moment, After Effects is rendering the effects and grade, so I can’t do too much on the laptop right now, but when it’s done I’ll be starting on the audio. This will probably be the most painful part for me coming from Vegas. Vegas was created as an audio editor, and it’s tool set and ease of use for audio editing is so far unmatched in my book. You can bet that I’ll be adding to this post once I finish that phase. I finished the final sound mix last night. What I found is that you really need a dual monitor setup to do any sort of serious mixing in Premiere. Fortunately I had another monitor to hook up to my laptop so the film was on my large screen and my laptop screen became my mixing console. I really liked the automation controls where I could move the faders to control levels and they were “recorded”. I’ve seen videos where if you’re using a physical mixing board with motorized faders, they’ll respond according to the automation. Pretty cool. When I initially installed the CS6 suite on this laptop, I didn’t install Audition, thinking I’d never use it. However, after watching some videos today on what it offers (Spectral Analyzing, for one) I’ve decided to learn Audition. To practice, I’m planning on undoing all my mix work from Premiere and redo in Audition and see how that feels. I never thought I’d say this, but Adobe, you got me. The ease in which AE, Photoshop and Audition play with Premiere has finally convinced me. Your tools have reached the point where I’m willing to take them seriously. I’ve even removed Vegas from my taskbar. I’m not ready just yet to fly without Vegas on the system, but I have a feeling I’m getting close. My transition from the Vegas/AE combo to the CS6 suite is a great example of my progressive filmmaking philosophy. If the tools work for me the way I need to use them, then I don’t care who makes it. I think to be a good independent today, you need to be progressive, always analyzing your workflow, always asking yourself, “What can I be doing better?”. For me, making a complete switch to CS6 seems like the right choice.